Healthy and easy recipe that will not take much of your time. Cut the eggplants in halves and scoop out the insides to create a â€œboatâ€. Chop the eggplant â€œmeatâ€ that you have scooped into small pieces. Cook the meat together eggplant bits, chopped onion, tomato, salt and pepper. Once everything is nicely cooked together add parsley and quinoa and shut the heat off. 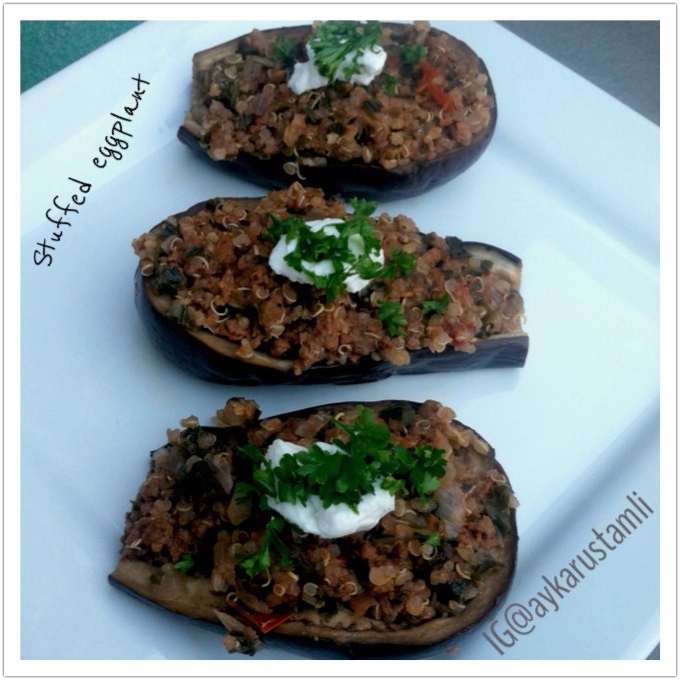 Sprinkle the eggplant with some salt and fill them with the filling. You can either bake them or cook them on the stove by adding 1/4 cup of water, bringing to boil and immediately bringing down to simmer. Cook for about an hour. Serving size 2-3 â€œboatsâ€.